The first person we will feature is SQNLDR Donald G. Andrews DFC, who was the first to befriend William Brambleberry in Perranporth UK. Detailed information about Don Andrews has previously been posted here but this post will focus on Don’s service with 453 Squadron. Donald George Andrews came from Southport in Queensland, Australia. He enlisted on 8 November 1940 at the RAAF Bradfield Park Initial Flight Training School in Sydney under the Empire Air Training Scheme. He was then sent to RAAF Narrandera No. 8 Elementary Flying Training School in December 1940 to train on Tiger Moths. In June 1941, Don was sent to the Service Flying Training School at Camp Borden in Ontario, Canada flying Harvards and Yales. He was granted his wings and commissioned then shipped to Llandow, Wales in the UK in November 1941. Due to a shortage of instructors, Don served as an instructor for one term and was then given his choice of Squadron. Don chose to fly Hurricanes first for 615 and then 245 Squadrons. 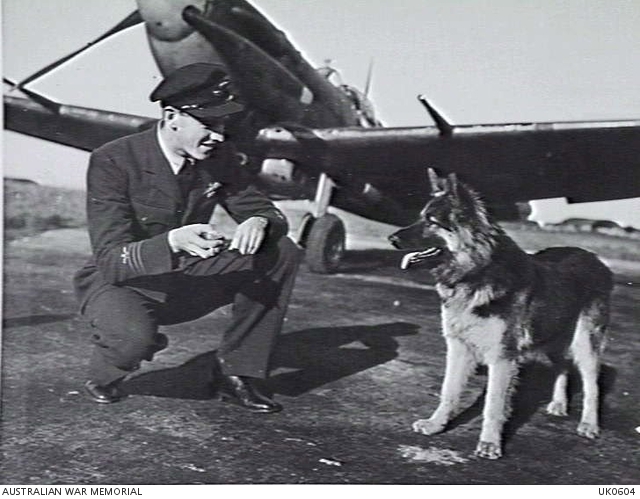 Don, now a Flight Lieutenant, joined 453 Squadron in December 1942 as the Flight Commander, replacing ‘Bobby’ Yarra who was shot down and killed in action. 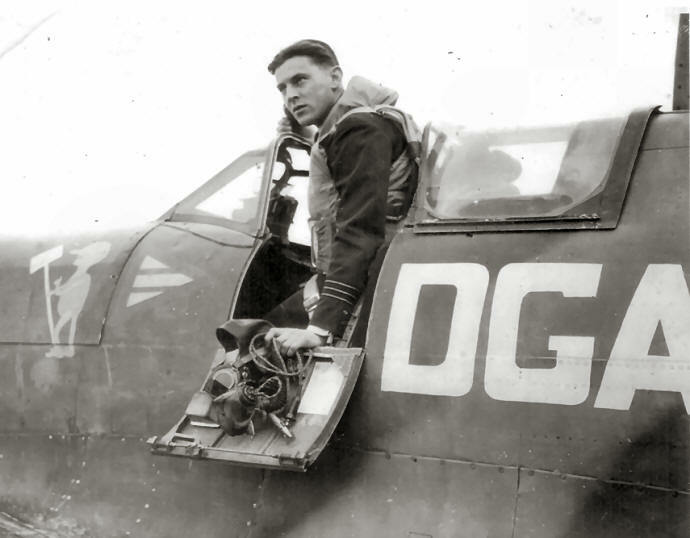 Don was the first 453 Squadron pilot to earn a Distinguished Flying Cross (DFC). On 15 August 1943, 453 Squadron was escorting American Marauders over Belgium when they were bounced by a dozen German fighters. 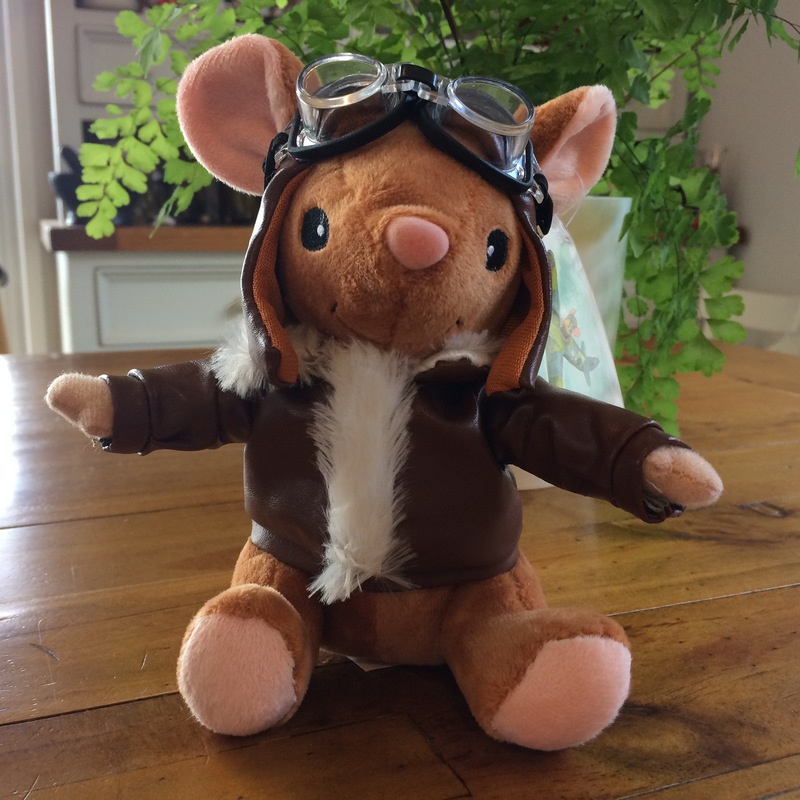 Don was separated from the rest of the Squadron and then jumped by six German fighters. 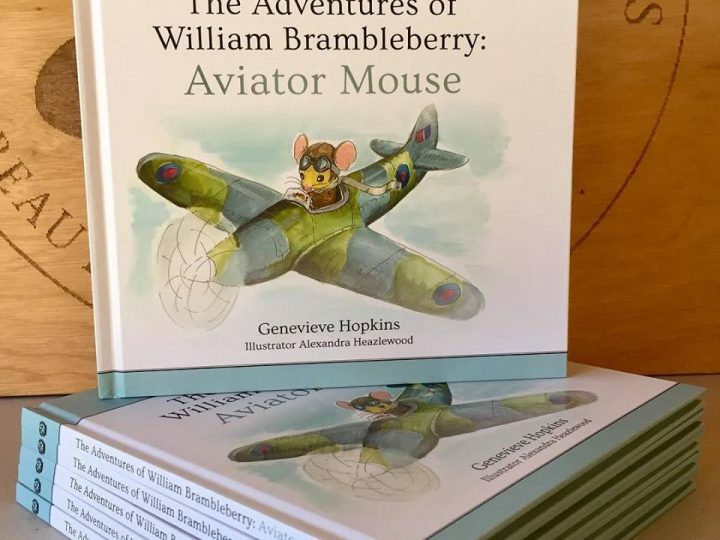 Though his Spitfire was peppered with bullets, he managed to make one kill, shooting down a Focke Wolfe 190 and landing safely at RAF Manton. Unfortunately, one 453 Squadron pilot was shot down and killed during the skirmish, Pilot Officer F. T. Thorny. 453 Squadron moved to Perranporth, Cornwall UK on 20 August 1943, which proved to be an eventful posting. 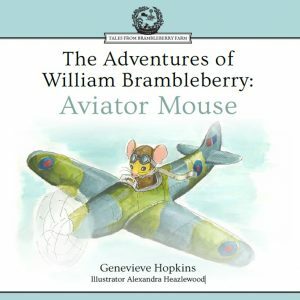 It was here that they met the bravest and most adventurous mouse, William Brambleberry. 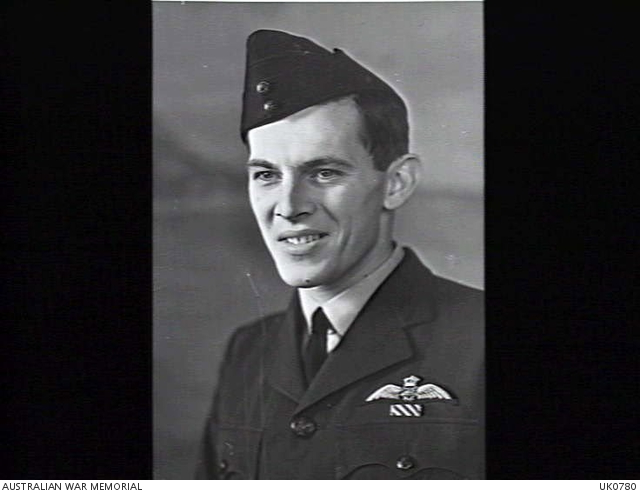 Don was awarded his DFC on September 24, and was promoted to Squadron Leader and became Squadron Commander on 8 October when Squadron Leader Kevin Barclay posted back to Australia. They also had one of their largest ever victories. Unfortunately, 453 Squadron lost another pilot in this skirmish, Flying Officer H.M. Parker. On 15 October the Squadron moved to Skeabrae in the Orkneys Islands to rest. 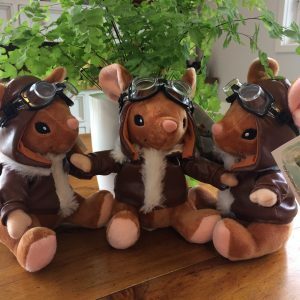 They were there for three months and didn’t do much flying due to winds averaging 60 mph. However, on 2 December Flight Lieutenant E.A.R. Esau and Flying Officer L. McAuliffe shared the kill of a Junkers Ju88. In October 1943, 453 Squadron moved to Detling, Kent and was incorporated into 2nd TAF in preparation for the D-Day Normandy Landings, where 453 and 451 Squadrons would provide air cover to the beaches during Operation Neptune, part of Operation Overlord. While waiting for D-Day orders, the Squadron provided protection to American bombers. 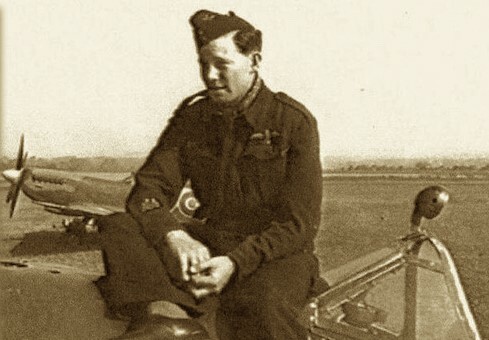 Don had been flying for 2 and a half years on operations when he handed over command of 453 Squadron to D.H. Smith on 2 May 1944 and posted out to instruct at Central Gunnery School for a well-earned break. D.H. Smith led the Squadron through the D-Day Normandy Landings and high paced operations until September 1944, when Squadron Leader E.A. Esau took over command of the Squadron. Don was promoted and returned to operations in February 1945, where he led the Australian Wing (453 and 451 Squadrons) as the Wing Commander based RAF Station Matlaske, Sussex. The Australian Spitfire Wing was tasked with counter-measures against the V2 long-range rocket bomb. It operated from bases in Britain and on the Continent, flew 1,328 sorties over Holland, bombed and strafed launching sites, workshops, and transport, and cut railway lines leading to the firing sites. At the end of the war, Don returned to Southport, Queensland, Australia, where he went back to work for the Commonwealth Bank of Australia, eventually retiring in October 1983. 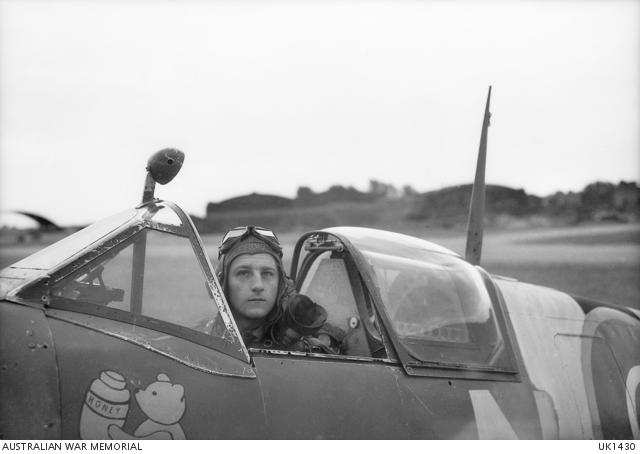 According to the Australian Spitfire Association‘s website, when questioned, Don said that he preferred flying Spitfires as he considered them vice free whereas by the later years of the war the Hurricanes had been superseded. He also flew Mustangs which he thought were marvellous, but heavier to manoeuvre and more solid than a Spitfire. He even tried out a Thunderbolt (nicknamed the Jug) and found them also very comfortable. Other aircraft flown were Vultee Vengeances and Tempests. CORNWALL, ENGLAND. C. 1943-10. 404795 SQUADRON LEADER D. G. ANDREWS DFC, SOUTHPORT, QLD, COMMANDING OFFICER, NO. 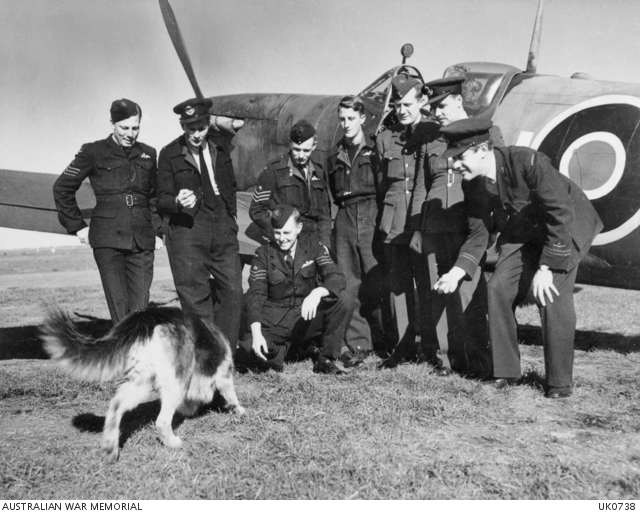 453 (SPITFIRE) SQUADRON RAAF, AT RAF STATION PERRANPORTH, WITH THE SQUADRON DOG “SPROG”. SUSSEX, ENGLAND. 1944-05-02. A SPITFIRE FIGHTER BOMBER AIRCRAFT OF NO. 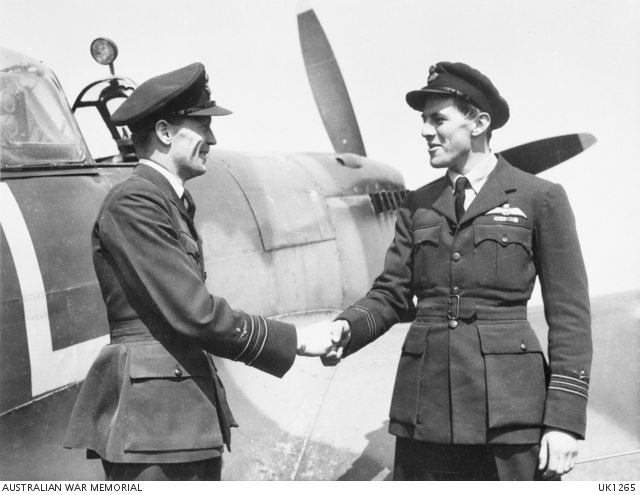 453 SQUADRON RAAF, BASED AT RAF STATION FORD, IS NOW COMMANDED BY 407256 SQUADRON LEADER (SQN LDR) D. H. SMITH, VICTOR HARBOR, SA (LEFT), WHO TAKES OVER FROM 404795 SQN LDR D. G. ANDREWS DFC, SOUTHPORT, QLD. RAF Station Matlaske, Sussex, England. 1945-04-14. Standing in the cockpit of his aircraft, 404795 Wing Commander Donald George Andrews DFC, of Southport, Qld, the leader of the first Australian fighter Wing to operate in Europe, a Spitfire wing which includes No. 451 and No. 453 Squadron RAAF, devoted itself entirely to counter-measures against the V2 long-range rocket bomb. Operating from bases in Britain and on the Continent, the wing flew 1,328 sorties over Holland, bombing and strafing launching sites, workshops and transport, and cutting railway lines leading to the firing sites. Note the noseart and letters ‘DGA’.